Version 8: Renewed GUI, Speed Optimization! Dear customers! We are glad to announce that we are releasing Handy Backup 8, the newest version of data backup and recovery software! 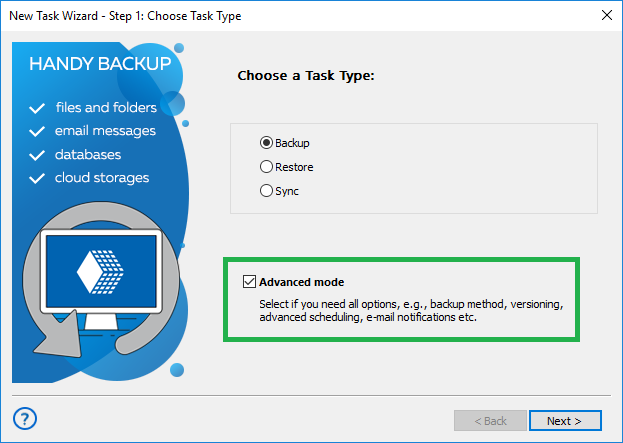 In this new version, you will see an updated graphical interface (GUI) with simplified and advanced task wizard modes, significant enhancement of speed and convenience for some functions such as Oracle Backup and MS SQL Server plug-ins. Upgrade* to the newest Handy Backup 8 and enjoy all its possibilities and comforts – just now! 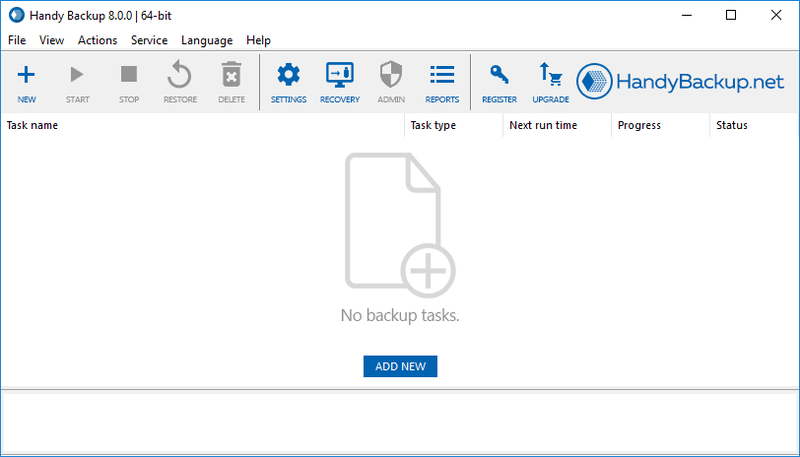 In Handy Backup 8, we have upgraded the interface to make it more modern, more elegant than before. It still looks intuitive, right? The main update for a new interface is a possibility to make a new task by an assistance of basic (simplified) or advanced (full-scale) task wizard. The simple mode allows using only the basic settings and functions, making no distractions for a user by a lot of advanced functions. In the advanced mode, a user has full control over the process of task creation, which allows using all functions and operations for fine-tuning a particular task. In the version 8, many algorithms have internal upgrades to speed up data exchange. This version will especially speeds up data exchange with online and cloud storage, and adds to convenience of other operations. The tested speed increment for transmitting multiple files shows a spectacular result of up to 27 times in backup and up to 9 times for recovery! For Oracle and MS SQL Server Backup plug-ins Handy Backup 8 now grants access for any registered DBMS administrator, not only for those who are registered as system administrators, too. In addition, now these database plug-ins configurable, allowing connecting to a database engine itself, not only taking its files from a local machine. Now you have no need to make updates from a product Web page. In Handy Backup 8, direct minor updates are available in a program interface. Just click an updating button, and Handy Backup will download all its components updated for a new version. After downloading, it will open an installer window automatically. 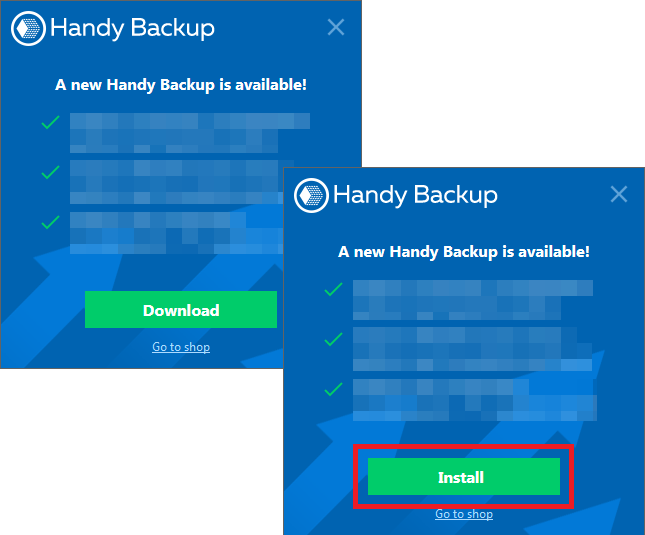 Handy Backup 8 has a simplified installer that allows installing a program copy with just few clicks. This can be very important for those people who administer many computers or entire local networks simultaneously. Still, the simplified installation mode does not lack any of useful setup features. * Upgrading from Handy Backup 7 to 8 requires payment. Learn more about Upgrade to version 8. Still, Handy Backup 7 is active and fully supported, so if you have purchased a copy of version 7 it will continue working without restrictions! However, all new features and updates will be for Handy Backup 8 only. How do I find my registration number of Handy Backup?